We all know that Green Plants 'breathe in' Carbon Dioxide and convert it to the oxygen during photosynthesis. So one might think that rising CO² levels would mean that the plants around us are all growing faster these days. 'Not quite' a new study in the journal Science explains. Beneficial Mycorrhizal Fungi that work symbiotically with roots them to liberate nutrients like nitrogen that are locked away in soils. Nitrogen is highly volatile: much of it is likely to escape into the environment as a gas or as a leachate into the water table before a plant can metabolize it. 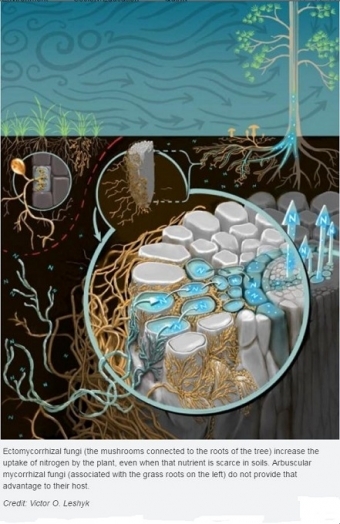 On the other hand, mycorrhizal symbiosis gives host plants a permanent community of fungal helpers that can symbiotically supply them with a wide array of nutrients latent in soils. Just one more reason why we need to get plants hooked up to their mycorrhizal partners whenever and wherever we can. There are thousands of species of mycorrhizal fungi working symbiotically with the roots of plants in undisturbed natural environments. The majority of mycorrhizae (95%) fall into 2 classes or types: Endomycorrhizae, or Ectomycorrhizae. Each plant species works with either one type or the other (in rare and interesting cases, some plants work with both types). The table (and downloadable PDF) at the bottom of this page shows which type of mycorrhizae plants work with. Both Endo's and Ecto's establish a beneficial symbiosis with roots, the difference between them is exactly how they connect to the plant host's root. "Nitrogen and mycorrhizae are like the X-factors in plant responses to CO²," said Bruce Hungate, Director of NAU's Center for Ecosystem Science and Society and Regents' Professor of Biological Sciences, who was a co-author on the study. "Rising CO² is not a universal fertilizer, but neither is nitrogen limitation a universal restriction on the CO² response. The truth is in the middle, and microbes are the key mediators," Hungate said. Root Rescue's Transplanter MS-CS contains 18 different species of Mycorrhizae (both Endo's and Ecto's). It's time to Root Rescue!